Discussion in 'Android Tablet News' started by dandroid, Apr 12, 2010. 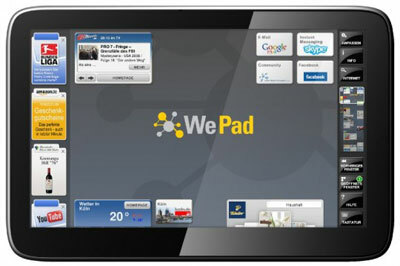 A new report from Slashgear indicates that the WePad Android Tablet is on the way and we might see it as early as July! "Remember the WePad? Another Android-based assault on the iPad, the touchscreen slate is getting its official launch today in Germany, including hardware specs [pdf link] and pricing. Kicking off at 449 ($611), the WePad has a 1.66GHz Intel Atom N450 processor paired with 16GB of flash storage, WiFi, Bluetooth 2.1 and a 1.3-megapixel camera; a 569 ($774) version will add in 3G and have 32GB of storage. Both models pack an 11.6-inch 1366 x 768 touchscreen, two USB 2.0 ports, Flash and Adobe AIR support and a LiIon battery good for up to 6hrs. Theres also optional GPS, a memory card reader, ambient light sensor, accelerometer and stereo speakers, plus an audio output. The project is a collaboration between 4titoo and Neofonie, with Siemens, Intel and Adobe as partners, and the WePad is apparently capable of Full HD 1080p playback (likely with some sort of integral Broadcom HD decoder). Preorders for the WePad will kick off  in Germany at least  come April 27th, with a soft-launch with limited availability in July. Broader availability isnt expected until August, and theres no word of an international launch at present." Gosh I hope this true, I'm so close to buying an ipad. I also want an Archos (5or7) doesn't matter...I would rather wait to see when this comes out. Although...If I get an ipad (for my wife ..) now, then I could get an Archos and it would seem like I was biting the bullet and giving her "the better option" until the wepad releases...then I could plead my case as to why she gets to have a bigger tablet than me..
>From now on, Amazon.de will take orders for both WeTab and WeTab 3G. Please note that for the moment, Amazon.de will be shipping to Germany only. More countries are going to follow - we keep you posted. Acutally, it looks like Amazon.de may be just taking orders at this point?